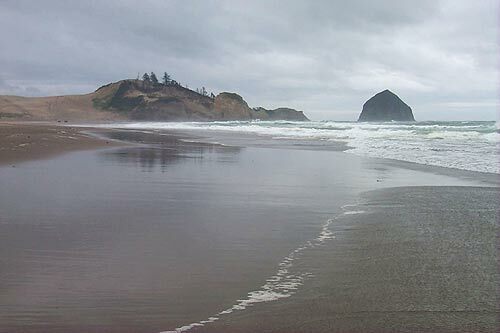 (Pacific City, Oregon) – About one mile north of Pacific City, just before you hit the Sand Lake Road junction and Tierra Del Mar, there's an unmarked, tiny road jetting off to the west from highway. There is no signage telling you what it is, so it appears to be a beach spot with no name – even though it really has two names. 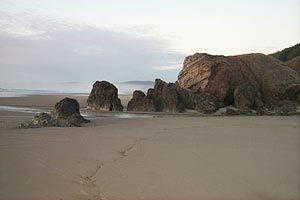 This is Cape Kiwanda State Park, and it’s sometimes called McPhillips Beach. Wind your way down to the mud and gravel parking spot, and you’ll find it’s technically legal to keep on going with your vehicle and drive down a muddy, rocky stretch of road that lets you drive on the beach. Sure it’s legal, but it’s not a good idea. It just dirties up the beach. Down here you’ll discover a load of interesting pleasures. Almost a mile of sandy beach stretches off to the south where the northern end of Cape Kiwanda sits – just waiting for you to climb this secret section of the popular Oregon coast attraction. To the north, you can keep on driving and bump into the beaches of Tierra Del Mar in about a mile as well. 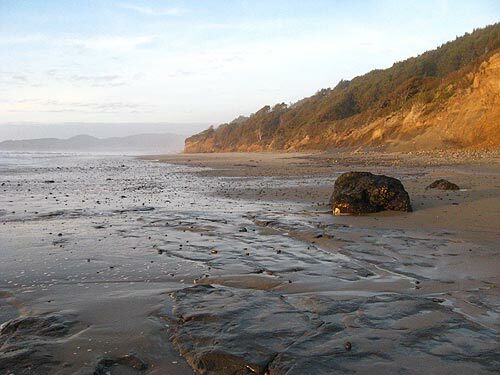 But first, as you initially emerge from the beach access, you’ll notice a long min-headland structure jutting out into the beach, which is mostly sandstone until it’s capped by a few fascinating basalt structures. Some of them look a bit like old Roman columns poking up from the sand. These are especially fun to crawl around at low tides, providing all sorts of interesting climbing opportunities. 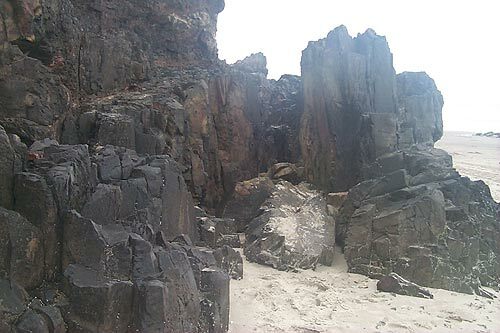 Basalt is actually former lava flows: these chunks of rock were once part of a large lava field. 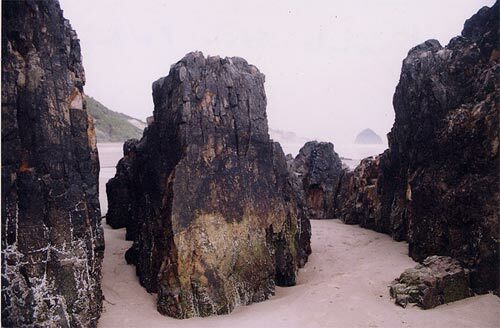 See the article on the geology of Cape Kiwanda for more. Being a state park, it is subject to state park rules, so pay attention to the signs at the bottom of the parking area. The other side of the mini-headland, towards Tierra Del Mar.